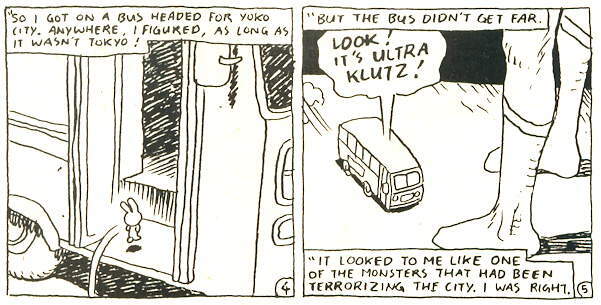 Ultra Klutz #28 (April 1990). So I was just poking through the Vast Mikester Comic Archives when I took note of the cover date on this comic. Barring the usual cover-date-usually-a-month-or-three-off shenanigans usually involved in comics (though this was a small press book, and may actually have come out in April), this comic is now 20 years old. The series is cartoonist Jeff Nicholson’s parody/homage/take-off on the Japanese giant-hero-versus-monsters TV show Ultraman , and unfortunately, this is the only issue of the series I own, so I don’t really have a whole lot to say about it. (You can read a more extensive appreciation of the series here.) Not sure why I wasn’t following it, exactly…Nicholson’s stories in this issue were amusing, and it wasn’t like I was shunning indies or black-and-white titles or anything. Probably just a case of “I can’t read everything” more than anything else. Anyway, I don’t really have a “review” as such of this comic….like I said, I grabbed it off the rack for the Brown back-up, was reasonably entertained by the rest of the book, and then stored the comic away. Plus, as far as I can remember, this is probably the first time I’ve read the comic since my original reading of it all those years ago. Mostly, I’m just amazed that, well, here’s something I just bought on a whim for a few minutes of entertainment…and here it is, still in my possession, two decades later. And here I am, just a few lines of this post back, thinking about looking for more comics to buy to plug holes in the ol’ collection. We really are slaves to our possessions, sometimes. But on the other hand, all those comics are helping to feed this here website, so it’s not all for nothing, I guess! 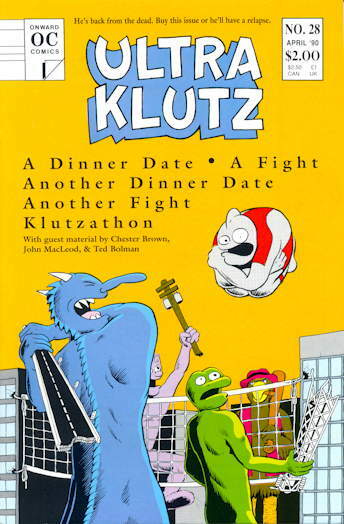 I always appreciated Ultraklutz, but didn’t really like it all that much. I was much happier when he moved on to other topics. His “Through the Habitrails” series (I think it started in the Taboo books) was a very early satire of office cubicle life that still has resonance, even after the rise of Dilbert. And Colonia is a good series. I will use present tense here, as I refuse to believe that there won’t be more Colonia published eventually. 1990 was only ten years ago, wasn’t it? Or did I lose a decade in there somewhere? I got one of these for the Chester story. It’s no Ed the Happy Clown though. I remember how it seemed as though everyone was putting out B/W comics from around 1984 – 1990. Some were horrible, others not so much. You know what I miss? Nicholson’s COLONIA. Man, that was a good series. Wonder if it’s ever going to continue? My story in this was an interesting collaboration — the storyline was plotted by Jeff, but he left the art layouts and the dialogue writing up to me. I expect he was free to veto anything I came up with, but he never asked me for any changes, he seemed happy with what I gave him. I wonder if Chester’s story was a similar process?